Sales of the newly released 2018 Native American $1 Coin moved quick out of the gate, according to the United States Mint figures. 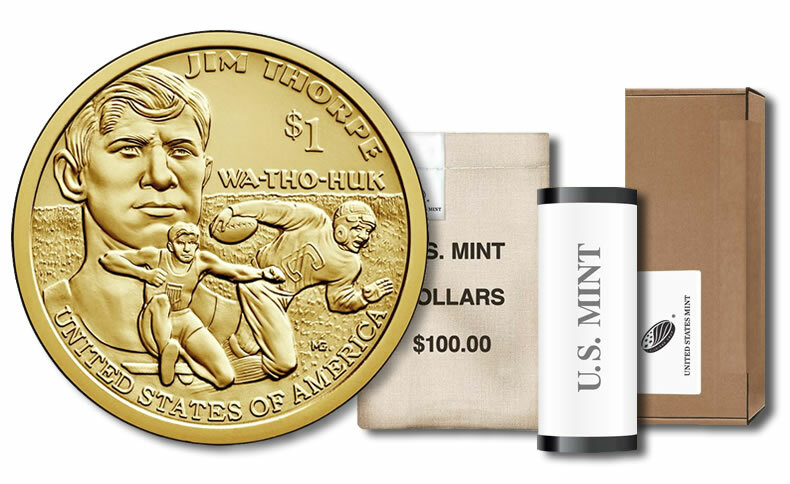 The series of dollar coins showcases annually changing reverses with the latest design depicting sports legend Jim Thorpe. Thorpe was a member of the Sac and Fox Nation. 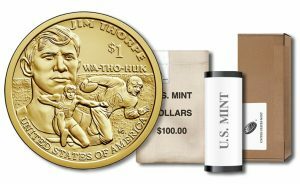 Collectors ordered a combined 1,150,800 coins through roll, bag and box options, marking the second best debut since the series began. The new dollars were among the Mint’s best-selling products. The U.S. Mint published sales data for 274 numismatic products. Thirty-four products outperformed their prior weekly gains against 75 previously. Not counting the new products so as to compare apples-to-apples, 5 products increased by more than 1,000 units compared to 4 previously. In addition, 15 products saw their sales totals reduced against 14 previously. Two of them declined more than typical — the 2018-W Proof Silver Eagle dropped 1,222 to 243,668 coins and the 2018-W Proof Platinum Eagle fell 199 to 9,047 coins. Below are tables showing the latest sales for U.S. Mint numismatic products. The sales period covers Feb. 12 to 18. Products with an asterisk (*) are no longer available or had no reported sales. Great sales on the 2017 1/10 ounce gold Liberty. I think we are going to see more Liberty coins at that weight in the future. Happy times. It’s looking like if you want a chance at a nice eagle in the future you need to order it as soon as they are released to avoid getting one that was returned from one of the graded coin sellers. Mouse maybe if they give us some different designs, this one is getting a little stale IMHO, never started like a house a’fire anyway! tuff for me to pay $2,150 an oz for AU when spot is quite choppy of late & the premium will NEVER be recoveered lest gold pop to the $2k level…….no one is going nuts over this design…..
Chas- I do agree about different designs and hope that the sales of the 1/10 ounce gold stay low. This coin was for my son. Modern coins will never realize any form of meaningful profit out of the gate. low sales = rarity in the future and by future I mean 50+ years. Now THAT’S what I call long range planning! Old Collector – my gold and silver stacks are for my retirement. Majority of my numismatic / historical coins are for my son as he has time on his side. Sadly some younger collectors are more concerned with trying to flip coins for a fast buck than realizing that coins take tremendous time to appreciate / hence all of the 6 figure historical coins sold at all major auction houses. The majority of all numismatic coins are only worth their weight / this younger generation want everything fast. If a coin does not realize quick – crazy money lol they feel it has no value. Historical coins take time – hence historical lol. You are wise to save for your retirement. It’s clear that Social Security was never meant to be able to pay all of one’s bills and/or expenses throughout retirement. That’s why it’s definitely smart to put a separate, personal nest egg aside for later, that is, for when regular earnings have ceased. I think it’s nice of you to not only think of yourself but also of your son as the reason for accumulating specific items; good for you!